We supply many industries with our capability to twist polypropylene and polyethylene monofilament from 1/8″ to 5/16″. Twisted yarn for braiding applications range from 5000 denier up to 120,000 denier, using either S or Z twist, according to customer specifications. 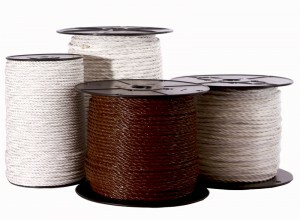 #96 Polyester twisted rope (3 ply) is made in packages up to 15 lbs. Rope is sold per pound with a 500 lb. minimum order. Call our sales staff for ordering and pricing. Custom orders available.